The RBI will by month-end invite applications for setting up small finance and payment banks, which will cater to low-income households and small businesses, after putting in place final norms in this regard. Kunal Shah, a 32-year-old Indian-origin managing director at Goldman Sachs, is among the 78 individuals to be promoted to the position of partner, becoming the youngest to be inducted into the investment giant’s most coveted club. Delhi Metro and Yamuna Expressway are among the six Indian infrastructure ventures that have figured in the list of world's most innovative, impactful infrastructure projects prepared by international accounting firm KPMG. Baroness Sandip Verma, Parliamentary Under Secretary, Department of Energy & Climate Change, UK, interacted with industry representatives from the region at a session on 'Strengthening UK Trade with Punjab and Haryana', organised by CII and The British High Commission here today. Has the time come for SEBI to reinvent and reorient itself to reflect the ground realities and complexities of corporate India in a rapidly evolving economy? The advent of high speed 4G mobile services could help in solving the logistics and connectivity issues affecting e-commerce, CommunicationsMinister Ravi Shankar Prasad said today. These banks are expected to bring in a large chunk of the public, especially in rural areas and other places with low penetration, into the formal banking system. "We visualise mobile companies, companies with large rural presence, may be shops, may be kiosks, as well as possibly the post offices seeking payment bank licences," RBI Governor Raghuram Rajan said. "In the weeks to come, we would put out the final guidelines on payment banks. The guidelines are currently with the government for comments. I am hopeful that by the end of the month we will call applications for both small finance and payment banks," he said at a micro finance conclave, organised by the Nabard here. Deepening the financial inclusion was one of the five items of agenda Rajan had set for himself after he took over last year. The central bank had earlier awarded universal banking licences to infra lender IDFC and micro lender Bandhan. The two new licences were issued after a gap of 12 years. One of the suggestions from the industry on the draft guidelines on small banks, Rajan said, is allowing all-India small finance banks instead local area ones. But, he said, if at all the proposal was accepted, they will be allowed to take only deposits and extend loans predominantly to small entities. 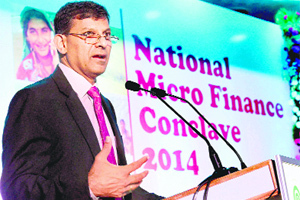 Stating that the small bank licence would offer avenue for successful micro-finance institutions to migrate to banking licence without it affecting their core business of working with small and the excluded, Rajan said a decision on this has to come from the government. Small finance banks would provide a whole suite of basic banking products such as deposits and supply of credit, but in a limited area of operations. Payment banks would offer a limited range of products such as demand deposits and remittances. They would have a widespread network of access points particularly in remote areas, either through their own branch network or through business correspondents or through networks provided by others. Rajan said following the publication of the final guidelines, the central bank will invite applications for setting up these banks. The Governor said entirely new players, including supermarket chains and post offices, may apply for setting up these banks. He expressed reservation over the loan waiver scheme by various state governments and suggested reasonable interest rate ceiling on loans from microfinance lenders. "Repeated loan waivers by various state governments distort credit pricing, thereby also disrupting the credit market," he said. He said borrowers who avail of funds from microfinance institutions should be protected from arbitrary loan pricing. "There should be a reasonable ceiling on interest rate on loans from microfinance lenders for consumer protection," he said. Shah is one of the five persons of Indian-origin to have made the cut in Goldman Sachs in 2014 class of partners. He was promoted to managing director at the investment banking giant at the age of 27. The Cambridge University mathematics graduate was also named in Forbes ‘30 under 30’ Finance list in 2011. He has been a rising star at Goldman since he joined the company in London in 2004, analysing interest rate products, before trading on the global macro desk, according to Forbes. The other persons of Indian-origin named to the firm’s elite group are Meena Lakdawala Flynn, Manikandan Natarajan, Umesh Subramanian and Rajesh Venkataramani. The other Indian infra projects to make the list of this year’s KPMG’s Infrastructure 100: World Markets report is Tata Power’s Mundra Ultra Mega Power Project in Gujarat, Interceptor Sewage System, Gujarat International Finance Tec-City (GIFT) and Narmada Canal Solar project. These projects were evaluated by 17 judges on the basis of their scale, feasibility, complexity, innovation and impact on society. In this year’s report, a global panel of independent industry experts once again identifies 100 of the world’s most inspirational and innovative infrastructure projects, many of which are expected to transform the way the world’s population interact with their cities, governments and environment, KPMG said. The report also highlights key trends driving infrastructure investment in key markets around the world and demonstrates how governments are coming together with the private sector to overcome funding constraints in order to finance and build projects that can improve quality of life — both solving immediate needs and planning for future societal demands. "Each country has its own approach to developing and funding infrastructure, yet all share the universal challenge of creating the right conditions to attract investment so desperately needed," James Stewart, KPMG’s chairman of Global Infrastructure said. The report says that 165-km-long Yamuna Expressway, which opened in 2012, is India's longest motorway, connecting the capital New Delhi with Agra and creating a corridor for economic growth. The report further says 10 years after its first line opened, the $2.3 billion Delhi Metro project, continues to expand, setting an example of how to carry out an effective public works programme. The $4.4 billion Mundra UMPP is a major, coal-fired thermal power plant serving the states of Gujarat, Rajasthan, Maharashtra, Haryana and Punjab. "Though India is comfortably placed in skills training at the basic level, the country, especially northern states of Punjab and Haryana, lack specialised skill sets that are imperative to enable them to achieve their future goals, including the new Government's dream project - Make in India campaign. UK is committed to share its best practices in technical and vocational education and our expertise to help these states achieve their desired skill objectives. We can open joint Centers of Excellence or host delegations in both countries", Verma said. This is the key question that the market watchers are asking, especially after the raging legal battle between SEBI and realty major DLF. SEBI had banned DLF, its promoters, and directors from accessing capital markets for three years. However, DLF got interim relief earlier this week from the Securities and Appellate Tribunal to redeem Rs 1,800 crore from mutual funds. Experts point out that while the regulator has done a stellar job of creating a robust, technology driven and nimble trading and surveillance paraphernalia in the country, with a firm grip over the years, but that grip, unfortunately, may be beginning to loosen. Minority and retail shareholders, which SEBI so vociferously vows to protect, are facing the brunt of the regulator's inability to keep pace with the changing times, they point out. SEBI's decision in the DLF case, where it arrived at an arbitrary decision after dragging its feet for seven long years, ended up drilling a Rs 7,500-crore hole in investor wealth in a single day. Experts say the regulator's approach points at a deeper malaise within its system that could throw up several DLF-like verdicts in the coming years. That indeed is a scary scenario and has serious ramifications for the markets, companies, investors and the economy at large. SEBI acted on the complaint of one individual, who alleged in 2007 that DLF's associate firm duped him of Rs 34 crore. The individual, who was not a DLF shareholder, further said the company had failed to mention about the pending litigation in its revised DRHP that became the basis of the IPO in 2007.